DASODA’s brand value is to assist women to seek happiness and beauty, to shine and live their own life story as beautiful heroines. An abundance of sensitivity, fashionable style, dreaming of your own special romance, wishing to “love and be loved, and to be recognised.” This represents the young, strong and proactive women of today who are up to new challenges and on-going transformations. 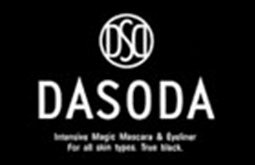 Dasoda cosmetics are gentle to the skin- with a formula dedicated to being mild on the skin, which was never before achieved by any eye make up. DASODA products effectively functions while at tracking repeat users with highly safe and effective products.